A Return to Greek-flag Cruise Ships? With Louis Cruise Lines having now raised the Greek flag over eight of its cruise ships, this Greek-Cypriot-owned company has actually become the largest employer of Greek merchant seafarers. Louis now owns thirteen cruise ships, of which it operates seven for its own account and four for Thomson Cruises while itwo recent purchases still operate for Norwegian Cruise Line. The Greeks, with all the islands of the Aegean, have always been an important part of passenger shipping. The Goulandris-owned Greek Line, founded in 1939, introduced the first Greek newbuilding, the Olympia, in 1953, and lasted until a fuel crisis put the line out of business in 1975. The Olympia still sails today, as the Regal Empress on short cruises from Fort Lauderdale to the Bahamas. But in the meantime the face of Greek cruise shipping has changed completely. The Greeks are probably best known for having introduced modern cruising to the Mediterranean in the 1950s. But of the family names involved - Potamianos, Kavounides, Efthymiades, Nomikos, Typaldos, Chandris, Panagopoulis - only one is still active today. Although Celebrity Cruises sprung from the Chandris family, who sold the line to Royal Caribbean in 1997, their ships had never flown the Greek flag. They still today carry the letter X for "chi" and most still have Greek masters and officers. That sale was not a loss to Greek shipping - the real demise came about in 2004, when not one but two Greek-owned cruise lines, Festival Cruises, with offices in Piraeus and Genoa, and Piraeus-based Royal Olympic Cruises, went out of business. Both had built new ships for the trade and it was these that many thought brought them into financial difficulty. After having ships arrested at different ports around the world, both disappeared within a few months. Things could have been different. 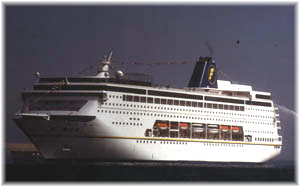 Carnival Corporation had taken control of Epirotiki Lines in 1994, but then withdrew when Epirotiki and Sun Lines agreed to merge into Royal Olympic in 1995. Louis Cruise Lines then took a stake in Royal Olympic in 1999 but later walked away. In May 2000, meanwhile, P&O agreed to buy Festival Cruises for $400 million, but it abandoned this plan in March 2001 after a fall in its stock price as P&O Cruises demerged from P&O. Either of these outcomes would have resulted in their absorption into an international conglomerate, the same one today as it turns out. As Festival and Royal Olympic went out of business their ships were acquired by other operators. Thereafter, Golden Sun Cruises, today operating as Monarch Classic Cruises, and Larnaka-based Louis Cruise Lines stepped into the breach, especially in the local cruise market from Piraeus. Golden Sun was Greek but Louis Cruise Lines, which had once owned Royal Olympic together with the Potamianos family, were Greek-Cypriot. Their own answer was to form Louis Hellenic Cruises in March 2005, and transfer ships into the Greek flag to operate cruises not only from Piraeus but also from Genoa, where it opened a branch office. Assisting this move into Greek flag was George Stathopoulos, a Greek-born cruise executive who had previously worked for all of Festival, Celebrity and Royal Olympic. Louis Cruise Lines itself is a subsidiary of the Cyprus-based tourism and travel group Louis Group PLC, founded in 1935. 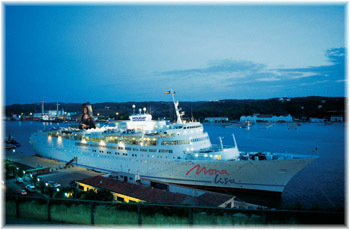 It purchased its first ship in 1985 and today operates under the Louis Cruise Lines name. Of the thirteen ships it owns today, it operates seven under its own name, on 3, 4, 6, 7, 8, 10 and 16-day cruises, and four under charter to Thomson Cruises. Four Greek-flag ships, the 790-lower-berth Aegean Pearl, 1,050-berth Aquamarine, 728-berth Orient Queen and 960-berth Cristal, their newest, all operate from Piraeus, while from the Cypriot port of Limassol it operates the Greek-flag 508-passenger Ivory and the 576-berth Marshall Islands-registered Sapphire. The Greek-flag Orient Queen and the 748-berth Cypriot-flag Coral meanwhile offer departures from both Genoa and Marseilles. Two more Greek-flag ships, the 486-berth Calypso and the 990-berth Emerald, presently operate for Thomson Cruises, as do the Cypriot-registered 1,450-berth Thomson Destiny and 1,254-berth Thomson Spirit. The Thomson Majesty, meanwhile, sister ship to the Thomson Spirit, is owned by Holland America and managed for Thomson by Columbia Ship Management of Limassol. Louis's own ship management company, Louis Shipmanagement Ltd, being based in Athens, further cements its Greek link. As mentioned in this column on April 28, Louis have recently acquired the 1,750-berth Norwegian Dream and 1,460-berth Norwegian Majesty from NCL and will charter them back until November 2008 and December 2009, respectively. The Dream will be the first to come free and although her future deployment has not yet been announced, the Emerald is doing her last season for Thomson, so she may well find employment there. With the acquisition of these ships, Louis has decided to retire two of its older ships. After 22 years carrying 1.3 million passengers from Limassol to the Eastern Mediterranean, Louis's flagship Princesa Marissa (628 lower berths), its first acquisition, is now to be sold as fleet renewal goes ahead. The Princesa Marissa was named after the chairman's daughter and played a fundamental role in placing Cyprus on the cruising map, while Louis Cruise Lines slowly grew to be the fifth largest cruise operator in the world. Louis is also disposing of the 600-berth Serenade, once well-known in the French market as the Mermoz. Back in Piraeus, Monarch Classic Cruises, formed by Andreas Potamianos and the Kollakis Group (Majestic International Cruises) in 2006, now operates two 800-passenger Portuguese-registered ships, the Blue Monarch and Ocean Countess, both formerly Royal Olympic ships, in the 3-, 4-, 7 and 14-day cruise market from Piraeus. As much of Monarch's business comes from America, it has joined the US-based Niche Cruise Marketing Alliance and opened an office in New York that offers fixed fares in US dollars to American travellers. Majestic International also own the Portuguese-registered Ocean Majesty, which have been operating in the UK charter market. The irony here is that while Louis now has eight Greek-flag ships, its chief competitor from Piraeus now operates under Portuguese flag. Some other Greeks also continue in the business of owning cruise ships while chartering them out to other operators, three of these in Germany. Leonardo Shipping of Piraeus owns the 780-berth Mona Lisa, which is now chartered to Lord Nelson Seereisen of Erkelenz, near Cologne, while Athens-based Enterprises Shipping & Trading has the 650-berth Delphin Voyager on to Delphin Kreuzfahrten of Offenbach. And this spring, Global Cruise Lines of Piraeus acquired Orient Line's 848-berth Marco Polo, which now operates under charter to Transocean Tours of Bremen. Another Greek-Cypriot, Stelios Haji-Iouannu, whose father owned the Piraeus-based Troodos Shipping Co Ltd, and who formed his own Athens-based Stelmar Shipping in 1992, founded easyJet in 1995. Last month, his easyCruise put into service his second cruise ship, the 600-passenger Maltese-flag EasyCruise Life, now cruising the Greek Islands. Although the EasyCruise Life was refitted in Greece, an earlier agreement between EasyCruise and Louis to build four new mid-size cruise ships in a Greek shipyard has fallen into abeyance. One shipowner who is Greek is George Potamianos, a relative of the Piraeus family who moved from Greece to Lisbon in 1985 and now heads up Classic International Cruises. This company operates five cruise ships (two of which were once the Greek-owned Danae and Daphne) under Portuguese flag. Although run from Lisbon, the head company, Arcalia Shipping Co Ltd, is still based in Cyprus. With a change in the Greek coasting regulations and in Greek manning laws, the Greek flag has all of a sudden become more attractive to at least one operator. Whereas Festival did not use the Greek flag at all, Royal Olympic did but had looked at putting their newbuildings under Dutch flag. Obviously, Greece joining the European Union has caused some change here and given Greek maritime circles to have second thoughts about their previous cabotage laws, at least as far as cruise ships are concerned. But the number of Portuguese-flag cruise ships with Greek connections is also quite remarkable.